Israel, Jordan, and the Palestinians signed the agreement in Washington today. Israeli Energy and Regional Development Minister Silvan Shalom told army radio that under the agreement water will be drawn from the Gulf of Aqaba at the northern end of the Red Sea. Shalom noted the economic aspects of supplying cheap desalinated water to neighbouring states, the environmental angle of “saving the Dead Sea” and the “strategic-diplomatic” aspect of the deal, being signed at a time when peace talks between Israel and the Palestinians are floundering. “This is a breakthrough after many years of efforts,” he said. It is nothing less than a historic move. According to Yediot, the Palestinian Authority’s minister in charge of water issues, Shaddad Attili, and Jordanian Water Minister Hazem Nasser will be signed the agreement with Shalom. Shalom said that following the signing, “an international tender will be issued for the entire project — building the desalination plant in Aqaba and laying the first of the four pipes”. According to Yediot Aharonot newspaper, which first broke the story, the idea dates back to the 1994 signing of a peace treaty between Israel and Jordan. The World Bank in 2012 published a feasibility study report on the project. Friends of the Earth Middle East and other environmental groups warned that a large influx of Red Sea water could radically change the Dead Sea’s fragile ecosystem, forming gypsum crystals and introducing red algae blooms. Gidon Bromberg, Israeli Director of EcoPeace/Friends of the Earth Middle East, told AFP the water sharing project had absolutely nothing to do with the much-maligned Red and Dead Sea conduit proposal, and accused an Israeli minister of deliberately misleading the public over the issue. “It’s a completely different project,” he said. “It’s a water exchange project that has an option to bring brine from the Gulf of Aqaba to the Dead Sea, should that be found workable”. But channelling brine generated from the proposed desalination plant which is to be built near Aqaba, up to the Dead Sea would cause the water-sharing project to fail, he said. 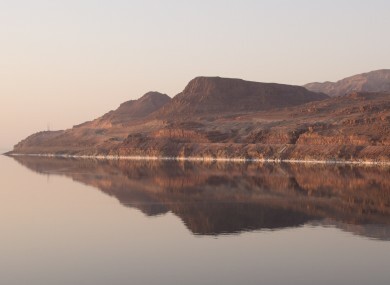 “Trying to link it to the Dead Sea will lead to its complete demise,” he said, noting that World Bank studies had found that introducing Red Sea brine could have “detrimental impacts” on the Dead Sea’s fragile ecosystem. Email “Deal signed to save shrinking Dead Sea by connecting it with Red Sea”. Feedback on “Deal signed to save shrinking Dead Sea by connecting it with Red Sea”.